Quick overview Understand the concepts and theories relevant to studying the internal and external contexts of HRM and the issues they raise with this textbook. HR functions within both internal and external contexts. The understanding of both contexts is crucial for comprehending how and why they drive HR strategies and practices in organizations, as well as the rules and structures within which they work. Built around five major themes which impact upon the HR function, and mapping to the CIPD Level 7 Advanced module of the same name, Human Resource Management in Context enables students to understand the complex and changing organizational context in which HR operates today by providing a comprehensive breakdown of the concepts, theories and issues from globalization and government policy to demographic, social and technological trends. 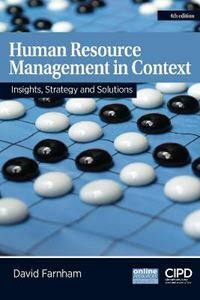 This fully updated 4th edition of Human Resource Management in Context includes a range of pedagogical features, balancing theory with practical analysis to form an engaging insight into the strategic side of HR. It includes enhanced emphasis on the impact of the external environment on the HR profession, a discussion of the impact of technology and social media, increased coverage of ethics and CSR and links to the HR Profession Map. Online supporting resources for lecturers include an instructor's manual, lecture slides, annotated web links and guidance for the chapter activities.